Family and friends may call at the Amos Carvelli Funeral Home, 201 Edison Street, Nutter Fort, on Sunday from 1:00 p.m. to 4:00 p.m. where the funeral service will be held on Monday, February 4, 2019 at 12:00 Noon with Pastor Brian Lamm presiding. Interment will follow in the West Virginia National Cemetery in Grafton, where full military graveside rites will be accorded. 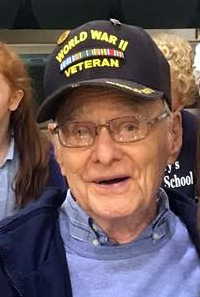 Edward George Zimmerman, 94, passed away peacefully on January 28, 2019 at The West Virginia Veterans Nursing Facility, Clarksburg West Virginia. Ed was born January 3, 1925 in Lincoln, Nebraska. He was the first of three children of the late Samuel C. Zimmerman and Anne C. Heiser Zimmerman. He was predeceased by his younger brother, Samuel J. Zimmerman and his sister, Mary Ann Zimmerman Watkins. Ed proudly served in the U. S. Army 97th Infantry as a cannoneer in the European theatre and during the occupation of Japan during World War II. This service resulted in significant hearing loss later in life. Upon returning to Lincoln he attended and graduated from the University of Nebraska. In 1947 he met and was united in marriage to the love of his life, Marjorie B. Stewart. They shared life’s road for 71 years and raised two daughters, Georgeann Glasscock and Jeanette M. D’Annunzio. Ed made his career in the finance world with Savings and Loan companies and finally with the Small Business Administration of the Federal Government working in offices in Minneapolis, Minn., Clarksburg, West Virginia and Charleston, West Virginia. He had many interests in life including reading, following the politics of the day and discussing issues with anyone interested. He spent many years researching his family history and documenting many generations. He loved to play golf and did so until after his 90th birthday. He always kept a well-groomed yard and loved to play ball with his dog. Most of all, he loved spending time with his family, especially his great-grandchildren. He leaves to treasure his memory, his wife, Marjorie of Clarksburg, daughters, Georgeann Glasscock and husband, Scott, of South Charleston, WV and Jean D’Annunzio and husband, Vincent F, of Clarksburg, WV. Grandchildren: Andrew (Kim) Glasscock and James Glasscock, of South Charleston, WV and Vincent M. (Ashley) D’Annunzio, Michael (Denah) D’Annunzio, Samuel (Alyssa) D’Annunzio, of Clarksburg, WV and Annamarie D’Annunzio. Great-grandchildren: Kolten Glasscock, Sofia D’Annunzio, Rocco D’Annunzio, Nicolina, Samuel, Vincent and Cecilia D’Annunzio.